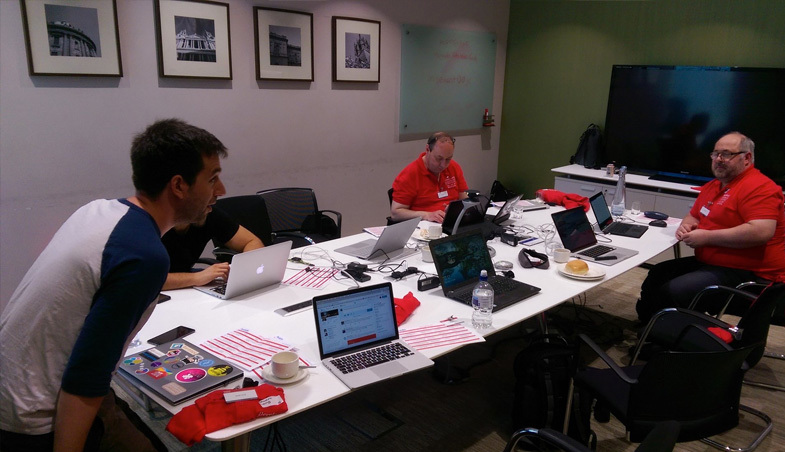 Retrospective of DDD 12 in Reading | Joseph Woodward, Software Developer"
Yesterday was my second time both attending and speaking at the DDD conference run out of the Microsoft offices in Reading, and as a tradition I like to finish the occasion by writing a short retrospective post highlighting the day. Living just two hours' drive from Reading I decided to drive up early in the morning with fellow Just Eater Stuart Lang who was also giving a talk. After arriving and grabbing our speaker polo shirts we headed to the speaker room to say hello to the other speakers - some of whom I know from previous conferences and through organising DDD South West. I always enjoying spending time in the speakers' room. 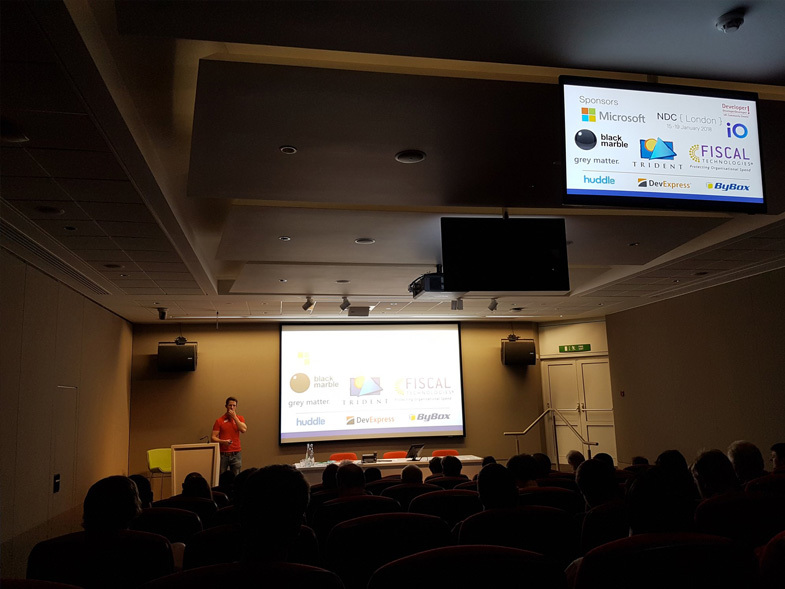 As a relative newcomer to speaking I find it's a great opportunity to get some tips from more experienced speakers as well as geek out about programming. In addition, I still had some preparation to do so it's a quiet room where I can refine and tweak my talk slides. Even though I had preparation to take care of for my post-lunch talk, I was determined to attend Sandeep Singh's talk on GraphQL as it's a technology I've heard lots about via podcasts and have been interested to learn more. In addition, working at Just Eat where we have a lot of distributed services that are extremely chatty over HTTP - I was interested to see if and where GraphQL could help. Having met Sandeep Singh for the first time at DDD South West he's clearly a knowledgeable guy so I was expecting great thing, and he delivered. The talk was very informative and by the end of the talk Sandeep had demonstrated the power of GraphQL (along with well-balanced considerations that need to be made) and answered the majority of questions I had forming in my notes as the talk progressed. It's definitely sparked my interest in the GraphQL and I'm keen to start playing with it. Having submitted two talks to DDD Reading (this and my Razor Deep Dive I delivered at DDD South West), the one that received the most votes was this talk, a topic and architectural style I've been extremely interested in for a number of years now (long before MediatR was a thing!). Having spoken at DDD Reading before, this year my talk was held in a rather intimidating room called Chicago that seats up to 90 with a stage overlooking the attendees. All in all I was happy with the way the talk went, however I did burn through my slides far faster than I did during practice, luckily though the attendees had plenty of questions so I had plenty of opportunity to answer and expand on them with the remaining time. I'll chalk this down to experience and learn from it. I must say that one of my concerns whilst preparing the talk was the split opinions around what CQRS really is, and how it differs to Bertrand Meyer's formulation of CQS (coincidentally, there was a healthy debate around the definition moments before my talk in the speakers' room between two speakers well-versed in the area!). Having worked with Stuart for a year now and known him for slightly longer, it's clear that his knowledge on async/await is spot on and certainly far deeper than any other developer I've met. 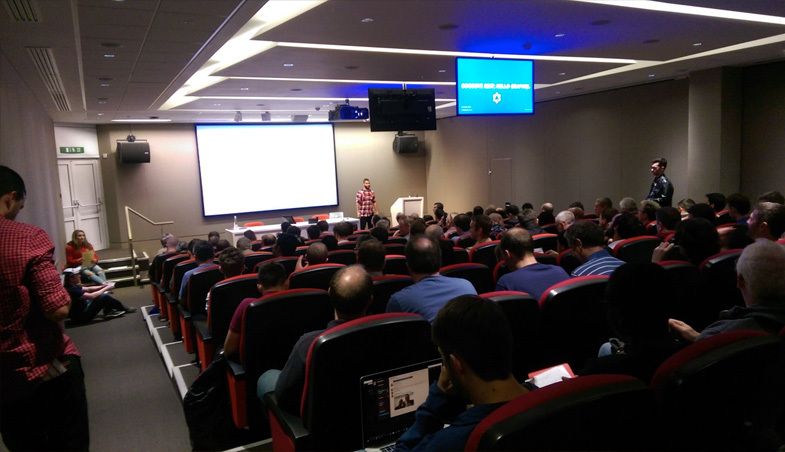 Having seen a slightly alternative version of his Stuart's talk delivered internally at Just Eat I was familiar with the narrative, however I was keen to attend to this talk because C#'s async language construct is deep area and one I'm interested in. Overall the talk went really well with a nice break in the middle allowing for time for questions before moving on (something I may have to try in my talk moving forward). Overall DDD 12 was an awesome day, I'd love to have attended more talks and spend more time speaking with people but keen to deliver my talk to the best of my ability I had work to be done. None the less after my talk was over it was great catching up with familiar faces and meeting new people (easily one of my favourite parts of a conference as I'm a bit of a chatterbox!). I'll close this post with a massive thanks to the event organisers (having helped organise DDD South West this year I have full appreciation for the hard work and time that goes into organising such an event), and also the sponsors - without them the conference would not have been possible.